After spending a couple of days with the folks we decided it was time to pay Parrsboro a visit. Parrsboro is the main flying spot in Nova Scotia due to the Bay of Fundy, which has huge cliff faces for pretty much every wind direction. Most of the launches are thus coastal beach sites, ridge soaring only, and accessible by car or a 5 minute walk. South winds are best here, as that means there are endless possibilities for launches along the entire northern Fundy Shore, just pick a section of cliffs you are interested in flying, set up, and launch. No landowner issues. However the LZ is another story. Since the highest tides in the world occur here (54' is the record, 40-50' is more common) you can lose your beach LZ depending on the tide cycle. It's best to check the tides ahead of time. The winds for Wednesday were northerly which meant flying at Joggins, which is about a 50 minute drive from Parrsboro (which is itself about 2 hours from my parent's house...usually when I go to Parrboro I stay for at least 2 days). Joggins is famous for it's fossil cliffs which anybody can visit and find fossils in (and also coal just laying around to be picked up from the rock faces when they erode), and is also very paraglider-friendly. Cliff faces from WNW-NNW and a combination of low and high cliffs depending on how strong the wind is. 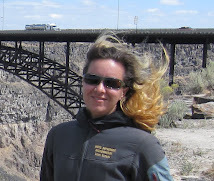 Wednesday the wind was pretty due north so we headed to a spot where you can lay out next to the highway, launch, and bench up to the higher fossil cliffs downwind. The winds on launch were rather light which meant you had to launch and head downwind right away, low, to the high cliffs and get up before sinking out. Once on the high stuff though you were golden. Alex launched first and sped away downwind to the high cliffs and got up no problem, and Brian and I lay out next (there was still snow and ice on the ground in spots so I wanted to lay out in a relatively dry spot). It did the same as Alex and was able to get up on the high cliffs no problem and then it was nice flying along the high fossil cliffs. It wasn't totally smooth though, as it was crossing a bit and cycles would come through which would cause my groundspeed to lower to the mid-single digits. Still OK but worth keeping an eye on. After a while I noticed it getting lighter so I opted to top-land next to the car and talk to Brian, which hadn't launched due to him not being sure about being able to get to the high stuff before sinking out. Alex had already top-landed and relaunched and was flying around when Brian and I noticed the wind ribbon going limp for a few minutes, and then all of a sudden switching to an offshore flow. Alex of course was sinking out as the lift shut off, and fortunately the new wind direction was light enough that it wasn't too rotory for him. But he didn't make it back to launch, beach-landed, and had to hike back. Flying over for the day. Brian had very generously loaned us his "spare" cabin on the beach at Partridge Island for the duration, complete with our own flying site with a launch right on the front lawn (for south winds), and a view of Partridge Island and Cape Blomidon in the distance. The next day was NW so Alex and I returned to Joggins but it was too strong for flying, so after digging for fossils for a bit and collecting some coal for the fireplace that evening, we headed to Advocate just to see was going on. 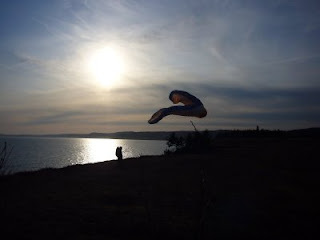 This flying site is situated at Cape Chignecto and takes a S-SW wind so we weren't expecting to fly, but when we arrived we were astonished to find it was actually SW and fairly strong. The local residents confirmed that it had been SW all day so we headed up to the launch, which is about a 5 minute walk inside the Provincial Park boundary (and the Park folks are very enthusiastic about us flying there, you just have to sign in). But up on launch it was not strong enough due to the winds actually being WSW we figured, and not coming ashore on that stretch of cliffs and only on the more exposed sections. So we headed back to Parrsboro and stopped at the primary flying site, Fox River, on the way. We had outdriven the SW winds at Advocate and they hadn't yet arrived at Fox River, but we could see it coming. Since Fox River is a SW site we decided to stay, especially since we ran into Randy (another local pilot) who was there limbing some trees behind launch. It was quite amazing to watch the wind switch from light N to strong SW in about 15 minutes, so we waited a bit to make sure it wasn't going to blow out or do anything weird. Randy assured us it was going to stay SW until dusk, about 1 hour away, so we both set up and launched in perfect 25 kph winds. Fox River is a straight ridge, not that long, and only about 30' high. Perfect for students and mellow flying, with lots of blow-back room into blueberry fields if the winds got too strong. We flew for about 1 hour until dusk, just as Randy said, and then top-landed as the winds got too light to stay up in. A perfect end to a day where we thought we were going to be shut down for flying, and it was so weird to know it was strong N at one flying site and strong SW not too far away. Today dawned with strong west winds and lots of lenticular clouds, not nice for flying, although we visited a few west sites that we could have flown had the winds been 10-15 kph less. One site is right on the Parrsboro golf course (you can launch from the green, although Brian usually launches just off the golf course out of courtesy). Another site is right next to town and is only about 15' high but perfectly flyable in west winds, although not as strong as they were today. The forecast was calling for possible rain tonight and NW winds again for the weekend so we have returned to Halifax for a bit. It'll probably be flyable at Joggins all weekend but we're going to do some non-PG things for a couple days before returning to Parrsboro. For pics go here. I'll be updating them as we have more adventures!